Green floral beaded sequin sparkly tapestry jacket size S. Beaded and sequin floral pattern over tapestry. By INDIGO MOON. 2 This is a Stunning. Hip length. very hard to show exact colour ~ close but not 100% exact. 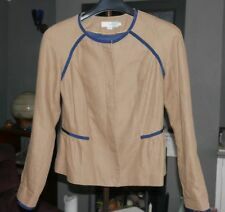 A lovely Boden jacket with press stud fasteners. In a light brown cotton mustard Size UK10. Armpit to armpit is 18" so chest is 36". Armpit to cuff approx 17.". and collar to hem is 21". ZARA HIP LENGTH JACKET ROUND NECKLINE ,LONG SLEEVES WITH BOWS ON THE CUFFS AND ZIP UP FASTENING IN THE FRONT. By INDIGO MOON. Mandarin style neckline. Black floral embroidered Chinese style long jacket size S. V This is a Stunning. Floral embroidery and sequins. very hard to show exact colour ~ close but not 100% exact. 63% cotton 37% polyester. It is in excellent condition. Zara blue patern jacket. All our products are 100% original Zara. Cutie 1950s 60s style jacket. Shawl collar, grey/green floral, swing crop. Sz L looks sz 14. Length- 20" shoulder to hem. Ladies Pink Jacket Size 10 from Atmosphere. Beautiful jacket with a pink floral detail and a double breast fastening. Fully lined. Slightly flared. In very good condition. PayPal only. No returns. Ivory blazer type jacket with dark grey floral design. Damart : Size 14. Nice fitting jacket and good weight. Used but like new. From a smoke free home. This is a lovely ladies patterned sleeveless top and cream jacket set size 12. The top is linen with a silky feel lining, the pattern is a mix of creams and browns and has a beaded detail on the bottom, the jacket is a plain cream linen with a button up detail, the neckline has a small daisy pattern. womens zipper/lightweight jacket... size 12. Dispatched with Royal Mail 2nd Class. A stunning sequined top and jacket set by Indigo Moon. Length: 25". Shoulder to shoulder 16". Armpit to armpit across 20". shoulder seem to cuff hem 25". shoulder to hem 24". Black river island jacket in a size 10 with white, grey and blue floral patterns. Only worn once - in very good, used condition and all of the quality you would expect from Zara. Was very expensive to buy new. This is a very rare and stunning fitted jacket / blazer - by Zara. This is in x2 shades of blue. Boden Size 8 Zip Up top. ZARA FLORAL EMBROIDERED BLAZER WITH GOLD BUTTONS. All our products are 100% original Zara. ZARA BLAZER WITH LAPEL COLLAR,LONG SLEEVES MATCHING LINING WITH CONTRASTING PIPING DETAIL,VENT AT THE BACK AND SINGLE BUTTON FASTENING.FEATURES MULTICOLORED FLORAL EMBROIDERY. Stunning Chinese folk coat. Item will need a signature. Blue & white floral patterned 2 piece jacket & trousers size 8. The trousers The jacket Very very light signs of being pre-worn. Hip length. 3/4 Length sleeves. very hard to show exact colour ~ close but not 100% exact. Size 14 uk. Lovely jacket/coat by NEXT. Length from armpit to hem approx. Yellow Navy Floral Striped Design. UK Size 10/12 - 12 on the label. Waist 39 15.21. Underarm to underarm 44 17.16. Shoulder to Shoulder 38 14.82. The label has been torn. Denim Jackets. Denim Waistcoats. Material: Cotton Elastane Blend. Size Guides. Colour: Pink. Size Guide. Condition: Fairly good condition with signs of wear. Size: UK 12. Le POP UP - Because life’s too short to wear boring clothes…. The value will be listed at the sales price. Jacket Length: 21". Sleeve Length: 26". Stunning blazer from Joe Browns size 16. fitted style fastens with different style buttons. lined in a navy an white vertical stripe. The blazer is good condition. The lining is dirty. Shoulder to shoulder - 16" (40.7 cm). Full length - 25.25 " (64.2 cm). Sleeve length from shoulder to cuff - 24.5" (62.3 cm). Candy pink striped inner lining. good clean condition. Sisley Floral Brocade 50's Style Cropped Jacket NWT FR38 UK10 Made In Italy Fab!